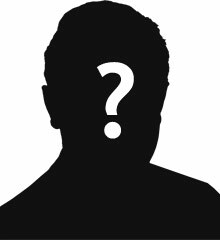 John James McCaughey was the son Catherine McCaughey. James was born in Clogher, County Tyrone about 1881. The family moved to Cookstown. His mother was a widow. James was a labourer. James McCaughey enlisted in the army on 12th July 1915. Private James McCaughey serving with the 8th Battalion of the Royal Inniskilling Fusiliers when he was killed in action on Wednesday 2nd August 1916 in France. 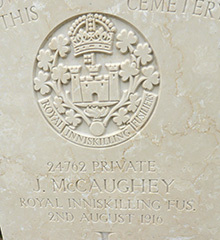 6 War Graves Photographic Project Gravestone photo of James McCaughey can be purchased here.